Belknap Press, 2014. 685 pages. Notes from GV4D4 week 2.
we look at wealth over time in the UK and France, taking a brief detour though literature (Balzac, Austen) to illustrate. Early on, land comprised most of the value of capital, but now it’s mostly housing/industrial/finance. Recall that both the UK and France were imperial powers with large foreign assets, which allowed them to run up trade deficits without larger economic problems. In the UK, with cap-inc ratio of 6:1, public assets are worth one years of NI (slightly less than in France); this is balanced out by public debt so roughly zero net wealth. Thus most wealth is private. One core difference between the two countries has to do with their treatment of debt. France defaulted on public debt (via inflation?) whereas the UK never did, and instead financed wars (etc) by borrowing from wealthy citizens, thus increasing public debt at the same time as private assets (the result of the British monarchy preferring to borrow money rather than raise taxes). Of course bondholders get paid interest, too. There was some inflation after both wars which lowered the value of public debts, but not to the same extent as in France. Still, this is what prompted Keynes’ famous 1936 claim of the “euthanasia of the rentier”, which was influenced by him seeing a collapse of rentierism as a result of inflation. The UK moved toward a more mixed economy (stronger welfare state and socialist policies like nationalisation) in the post-WWII era, which was influenced partly by the success of the Soviet Union and partly due to suspicions that the economic elite had collaborated with Axis Powers (mostly true). This resulted in both govts owning around 25-30% of their nation’s wealth by 1950s (though since the UK had massive debts, their net public wealth was negative until the 60s/70s). In the 70s, of course, things started to shift: cracks were visible in the Communist bloc, and stagflation + a tricky geopolitical situation paved the way for increasing liberalisation. Now we look at Germany, which is slightly different from the two cases above mostly because it had no colonial empire. Its capital consisted mostly of agricultural land. Hyperinflation in the 20s shrank the value of its post-WWI public debts, but of course that experience also had the effect of scarring the nation. During/after the wars, asset losses (mainly foreign) were more significant than physical destruction (revolutionary expropriation, nationalisation like that of the Suez canal). Plus firms went bankrupt during the depression, meaning stock/bondholders lost out, which had the effect of lowering the cap-income ratio and thus inequality. The US: lots of farmland (which meant value/acre wasn’t very high) + populated mostly by recent immigrants who couldn’t bring much capital with them, so capital low at first. This reflected structural differences in inequality compared to Europe, as landlords and wealth owners had less power in such a large country with plenty of arable land for the taking. After WWII, asset prices remained low, and we saw extremely progressive taxation and lots of government spending (New Deal), but no nationalisation (unlike in Europe—wonder why?). Recall that the US was never a true colonial power (at least not in the same way as the trailblazers over in Europe), and in fact had a negative net foreign capital during the 19th century. Also note the role of slavery in US wealth. Canada was similar to US but slightly different politically due to the legal influence of the UK (no tea partying for us). the capital/income ratio (which Piketty defines as β=s/g, savings over growth). In the golden age years, income was growing faster than wealth, but around the mid-70’s, wealth start to outpace income growth and so it began to pile up, which had the predictable consequence of reversing inequality trends. This chapter is a lot more technical and focused than the other readings (which makes sense, considering it’s a 600+ page book). Some topics covered: asset bubbles, dividends being taxed more than capital gains (providing an incentive to reinvest), foreign asset ownership, and financialization (which he defines by the value of assets rising more than net wealth). mostly on the capital-labour income split in the 21st century. Most salient idea: α=r*β computes the share of income from capital. 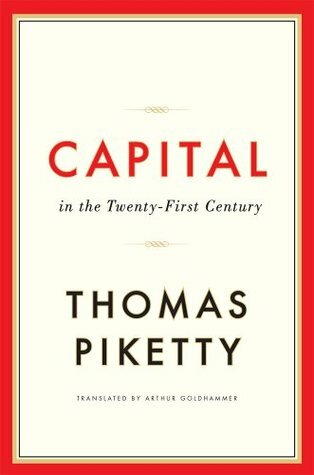 "meritocratic extremism": modern societies feel compelled to reward "winners" more generously if they give the impression that they accomplished what they did through "merit"
important to note that rent/inheritance are not just "imperfections" in the market; they are core features of capitalism!! !